In our newest ‘Home of the Week‘ we stay on the waterfront, as we move from a compound on the San Juan Islands to a stunning portfolio of properties right on Cohasset Harbor. This $44.9 million dollar estate comprising five unique properties, combines a one-of-a-kind family home, successful business interests and unsurpassed yachting and boating opportunities. This is seriously one of the most prized pieces of real estate you can find anywhere. On an over 9 acre peninsula just 25 miles south of Boston, the main residence boasts an impressive 20,000 square feet of interior living space that draws upon the heritage of historic stately New England homes. What results is an elegant and flawless melding of old and new. The 10 bedroom and 7 full and 4 bath mansion enjoys stunning views of the harbor from nearly every room and is absolutely perfect for entertaining. A few lively sets of tennis, swimming in the pool or private beach and al fresco dining are just a few of the ways you can pass the time on those perfectly cool New England days and nights. In addition to the main residence which can be purchased separately for $22 million, the estate also has the Cohasset Harbor Inn, which offers up 54 suites sprawling across 55,000 square feet. The Cohasset Harbor Inn is also home to a popular new restaurant and events facility. Rounding out the offerings are Atlantica & Old Salt House, which is a renowned restaurant complex and wedding destination. The Mill River Marina, which was recently renovated to include an expansive deck and rail launching system also comes with this unique set of properties. Click here to see more of this phenomenal ‘Home of the Week’ listed by Jonathan Radford with Coldwell Banker Residential Brokerage. In our newest 'Home of the Week' we move from a beach house in Carlsbad, California to a stunning celebrity getaway in picturesque Kailua-Kona, Hawaii. 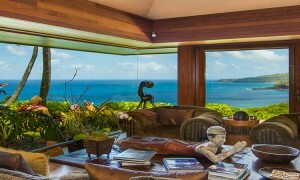 One of the world's finest homes set on Kauai’s fabled North Shore.